3" and 31/2" magnum shells: three in magazine, one in chamber. 23A" shells: four in magazine, one in chamber. 3" magnum loads: three in magazine, one in chamber. 2 /4" shells: four in magazine, one in chamber. Two shells in magazine, one in chamber. IMPORTANT: Because 3" and 3W shotguns can handle mixed shells of different lengths, total capacity may be affected. • Be sure all grease and oil have been removed from the barrel and chamber and there are no obstructions. • Your shotgun is pointed in a safe direction. • The safety is in the "on safe" position. • You are in an appropriate location for shooting. 1. Place the safety in the "on safe" position. 2. Open the action by pulling back fully on the operating handle. The bolt will lock in the rearward position. Always verify that the magazine and chamber contain no shells when the action is opened. 3. A shell can now be placed directly into the ejection port (Figure 9). 4. Press the carrier release button located just below the ejection port. This will automatically move the shell placed in the ejection port into the chamber. Keep your fingers clear of the ejection port when closing the action with the carrier release button. IMPORTANT: THE FIREARM IS NOW READY TO FIRE BY MOVING THE SAFETY TO THE "OFF SAFE" POSITION AND PULLING THE TRIGGER. DO NOT CARRY A FIREARM WITH A SHELL IN THE CHAMBER TO A VOID ACCIDENTAL DISCHARGE. IN ALL CASES, WHEN LOADING AND WHEN FIRING IS NO LONGER IMMINENT, MAKE SURE THE SAFETY IS IN THE "ON SAFE" POSITION. 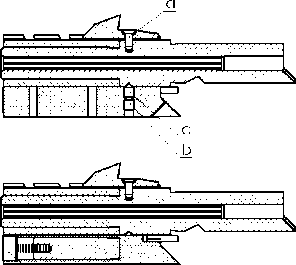 After firing with an empty magazine, the bolt will lock rearward, ready for inserting the next shell into the open ejection port. 1. Place the safety in the "on safe" position and close the action by pressing the carrier release button. up into the magazine until the shell is held in the magazine by the shell stop (Figure 10). Make sure the rim of the shell engages the cartridge stop and is held fully inside the magazine tube. It will make an audible click when fully inserted. 3. Repeat the procedure until the magazine is fully loaded. 4. If firing is imminent, a shell can be moved from the magazine to the chamber by pulling back fully on the operating handle and releasing it forward. A shell will be fed from the magazine to the chamber as the bolt closes. Another shell can then be inserted into the magazine, reloading it to full capacity. IMPORTANT: THE FIREARM IS NOW READY TO FIRE BY MOVING THE SAFETY TO THE "OFF SAFE" POSITION AND PULLING THE TRIGGER. DO NOT CARRY A FIREARM WITH A SHELL IN THE CHAMBER TO AVOID ACCIDENTAL DISCHARGE. IN ALL CASES, WHEN LOADING AND WHEN FIRING IS NO LONGER IMMINENT, MAKE SURE THE SAFETY IS IN THE "ON SAFE" POSITION.